I don't know about you, but it feels like time is flying by. I can't believe it is May this week. As a teacher that brings a smile to my face since I know that summer is right around the corner. I have been slacking lately on my cooking and blog projects so I am looking forward to the relaxing pace of summer and having more time to work on fun stuff. The weather here in South Florida was very dreary this week so I guess that may be why both of this week's features are classic comfort foods. Something about rainy weather (even hot rainy weather) kind of makes me want to curl up at home and make warm, homestyle food. My husband would think he had died and gone to heaven if I made him this homemade gravy from Liz at Love Grows Wild. I have never made gravy like that from scratch so maybe I will have to use some of my free mornings this summer to try it. You may not know this about me, but I LOVE chicken pot pie. We are constantly trying new versions of this classic recipe and when I saw Rill from Rill's Menu had linked up her version of this dish, I knew we would be trying it soon. Thank you so much for featuring my biscuits and gravy Kaylee! I hope you and your hubby enjoy them as much as we do! Yum, that looks good. I know what you mean, is it really almost MAY? Amazing. Thanks so much for hosting! 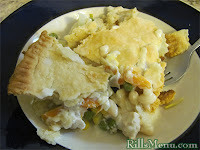 Oh I so love Chicken Pot Pie and who could turn down biscuits and gravy:) Total comfort foodies. Thank you so much for hosting again this week. I so appreciate you allowing me to post my little creations on your amazing blog.